You’ve heard it time and time again: backup, backup, backup. Updating software? Backup first. Installing a new hard drive? Backup first. Sounds simply enough, but how many of us are really doing it, or if we are backing up, how many of us are doing it correctly? 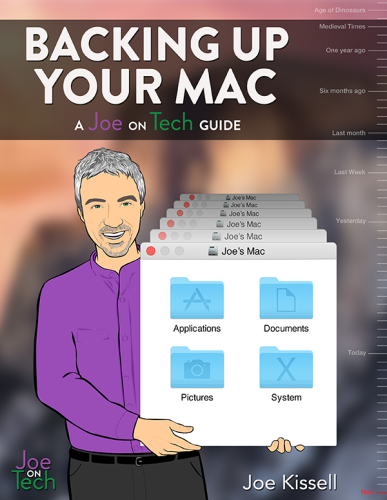 Never fear, Joe Kissell is here to help us with his latest book, Backing Up Your Mac. If you’ve read any of Kissell’s Take Control books, then Backing Up Your Mac will feel very familiar. You don’t need to read the book cover to cover, or even sequentially, but I suggest you do. Read the Quick Start chapter first, then decide which sections are most appropriate for your situation. For someone who has never backed up their computer or hasn’t changed their backup strategy in many years, terminology can be quite confusing. Versioning, reduplication, rolling backups, pruning: it can make anyone’s head explode, even people like me who are constantly tweaking their backups. I use Time Machine, CrashPlan in the cloud and locally, and clone my MacBook Pro using SuperDuper. I also have a NAS (network attached storage) and numerous external hard drives for multiple copies of my photos and music. I thought I had my backup strategy covered. And I did. Sort of. After reading Backing Up Your Mac I realized even I had a lot to learn. I strongly recommend that everyone read the chapter Choose Backup Software. Then read it again. And possibly again. There’s a lot of information to process, and it needs time to sink in. Did you know there’s more to choosing a hard drive than just storage capacity? How it connects to your Mac, drive speed, hardware support, and type of backup all factor in to the buying decision. Kissell discusses how to choose the hard drive that’s right for you and your circumstances, and what you should and shouldn’t spend your money on when making that final selection. Once you’ve decided on software and storage, the fun begins. Kissell goes into great detail explaining terminology, pros and cons of various options, how to restore from a backup, keeping backups secure, managing your media, and testing your backups. Consider Backing Up Your Mac your backup bible. One theme that’s consistent in Kissell’s books: he never tells you what you should do (other than making sure you backup! ); rather he offers suggestions, options, and choices. He uses his years of experience to explain why one method may work better than another, but leaves the ultimate choice up to the individual. Readers can feel confident after finishing Backing Up Your Mac that they’ll have all the facts they need to make an informed decision on backup strategy. Kissell has kindly offered readers two bonuses with the purchase of Backing Up Your Mac. The first is a set of downloads to help teach the book. The Cheat Sheet is a one page outline that highlights key points from the book, perfect to print out and keep close to your computer for reference. If you need a little more for a presentation a PDF is available that covers the main points of the book. The second bonus is worth the price of the book alone. Backing Up Your Mac: The Online Appendixes is a resource of almost 100 Mac backup products and services and is updated when appropriate. It’s a great place to look over what the various options have to offer before going to a specific web site for further information. Backup strategies are a personal decision. What works for one person may not work for another, or may not seem intuitive to someone else. That’s why there is an abundance of options on how we can back up our Macs. Backing Up Your Mac is a must-have resource to help you configure the game plan that’s right for you.